Okadaman is the new Japanese food truck that just hit New York City, with some of the most unique food I have ever seen coming out a truck. I would describe Okadaman more as a gourmet restaurant on wheels than a food truck; I just wished they had some outdoor seating to provide during the wait. Okadaman’s signature dish, the okonomiyaki is a Japanese cross between a pancake and an omelet, and made with a interesting mix of traditional ingredients. The name comes from the okonomi, meaning “what you like” and the word yaki, meaning “cooked”. This dish was originally served n the late 1930’s in Japan, and became increasingly popular during the war when rice became scarce. The ingredients that go into the batter are a combination of flower, yam, water, eggs, shredded cabbage and green onion. The chefs are very particular about their batter, and even toss it out if it’s not deemed exceptional by the head chef, named Okadaman. Once the batter is placed on the grill you can choose either pork or squid as a topping. I opted to get the lunch combo of half a squid okonomiyaki and half yakisoba. 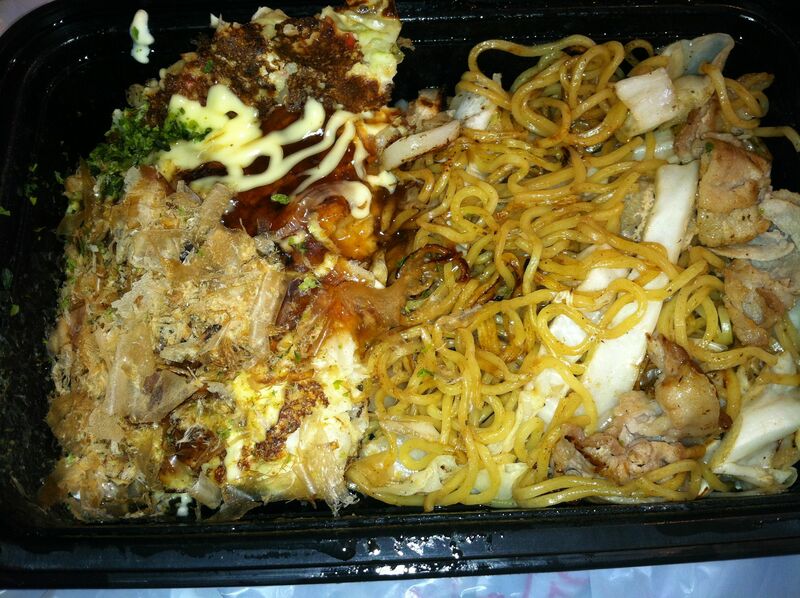 Yakisoba are fried wheat noodles similar in texture to ramen, and served with bonito flakes and thick slices of pork. At $7.50 for this combo platter, I was more than pleased with the amount of food I was served, and genuinely shocked at how good it all tasted. The okonomiyaki has a smooth creamy taste, paired with the salty, fishy flavors from the bonito, and a delicious sweetness from the brown and white sauces gave the entire dish a deep combination of flavors. The yakisoba was just as good, with a slightly smoky taste, the familiar crunch of ramen noodles and savory hunks of pork. Since eating from Okadaman I haven’t been able to stop raving about how good the food is; only it took about thirty minutes for my food to be prepared after I ordered. Nonetheless, I know I’ll return soon, probably for their takoyaki (octopus balls) which I’ve sampled in sushi restaurants but would love to try from an authentic truck like this. Next Entry:I Scream. You Scream. We All Scream for Ice Cream!